This new image and brand was created and applied to it's website redesign, collateral, and marketing materials. 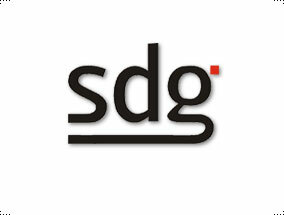 The new SDG brand conveys SDG as technically savvy playing off the stylized pixel as seen in the tip of the 'g' in the logo. This same pixel flavor was applied to all imagery throughout the web site as well as supporting collateral and marketing materials.